A night full off surprises starting at our first secret destination - the hotel "ETT HEM"
Me arriving on crutches after my foot operation - in 6 weeks I can dance again! Ett Hem was a private residence built in 1910, for two people who loved art and beautiful things. They left their mark on this townhouse, situated in a peaceful, residential area of Stockholm. This Arts and Crafts building is a tranquil home away from home, steeped in the Scandinavian aesthetics of Carl Larsson and his wife Karin. Transforming the house into a hotel has been a delicate process: its personality had to remain intact. Yet it also had to offer all the services required by modern travellers. 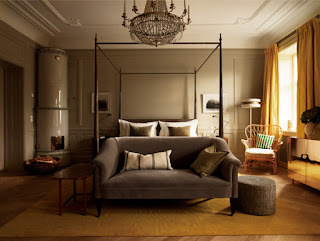 The result is that Ett Hem is again filled with the best collection of furniture, Scandinavian antiques and design. Things that frame moments in life. With twelve rooms, Ett Hem offers discerning guests comfortable interiors and bedrooms full of summery whiteness of light. Outdoors, the courtyard garden is a room as important as those inside. It’s a secret city wilderness that is the perfect place for summer breakfasts or winding down over a chilled bottle of wine. 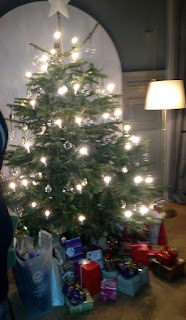 The Christmas tree dressed in silver and white, all our gifts under the tree... all 34 of them! Emma dressed to impress and struggled to "stroll" in the deep snow with her 12 cm stilettos! My team had booked the whole restaurant for private use ! A small hot dog for appetiser... "jummy"! its made of olives and veal with a sourdough bread. Potato fritter with bleak roe. We all had a wonderful afternoon and evening, some of the our colleagues went out to dance the whole night!